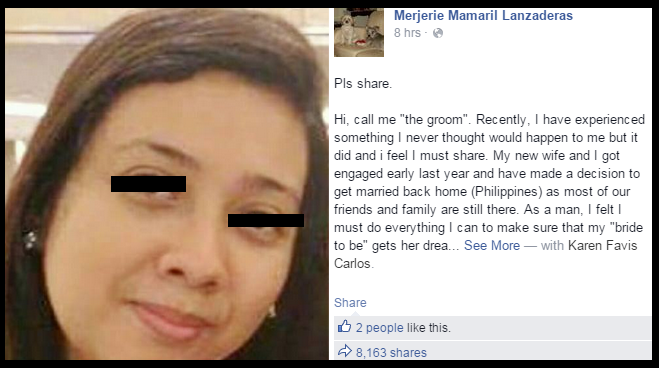 A female wedding coordinator in Manila is being accused of carting away millions of pesos from a balikbayan couple who just recently returned home to the Philippines in order to get married. In a long post that he published on the social networking site Facebook, Merjerie Mamaril Lanzaderas (the groom) detailed what transpired between him, his wife and a female coordinator he identified as Karen Favis Carlos. The gist of Lanzaderas's post is that Carlos scammed him and his wife of millions of pesos that were supposed to have been spent on their wedding day. According to Lanzaderas, he and his fiance got engaged sometime in 2014. They are both based overseas. And since most of their friends and families are still living in the Philippines, the couple planned on getting back home to get married. They decided to hire a wedding coordinator based in the Philippines to oversee the wedding preparations. With the recommendation of a friend, the couple got in touch with Carlos and hired her as their wedding coordinator. Also in 2014, the couple met with Carlos and her family to iron out the details of the wedding. The couple also made the necessary downpayments for the services needed in the upcoming wedding. Everything seemed to be in order after the meeting with Carlos. But things got really messy on the wedding day which happened on July 18, 2015. According to Lanzaderas, Carlos didn't show up, she can't be contacted on her phone, and she deactivated her Facebook account. Carlos's assistants arrived at the venue but Carlos herself never showed up. That was when Lanzaderas realized that they may have been scammed. 1. There were no flowers waiting at the hotel where they were booked. The groom said that it was his wife's dream to have flowers by Teddy Manuel, a leading floral designer in the Philippines. But there were no Teddy Manuel flowers at the hotel. The worst part is that the groom says he holds receipts and contracts saying that the flowers were paid for two months prior. At the wedding, the couple's entourage didn't have any flowers. There were also no flowers at the church. And the bride used a bouquet of flowers that were bought from a store. 2. There was no bride's limo as well. The groom also holds a receipt given to him by Carlos showing that a limo from Don Robert's Bridal Cars was paid for months prior. 3. At the venue of the after-wedding party, the ballroom wasn't what the couple expected. The groom said that they paid for the venue's most expensive package but they were only given the basic services. The groom also lamented that the DJ as well as the event emcee were different. 4. The catering services were not paid. Lanzaderas said that they have paid nearly half a million pesos for the catering services and that they have a receipt for it. Lanzaderas suspects that the receipts and contracts that Carlos gave to him and his wife were fake and forged. They called Teddy Manuel and the latter confirmed their worst fear - there was never a contract between them at all. According to the groom, the contract with Don Robert's Bridal Cars was faked as well. In the end of his Facebook post, Lanzaderas exclaimed that Carlos "looked decent and trusting but she is the most heartless person" they have ever met. Lanzaderas also warned other people who might come across Carlos and her wedding services. A quick search on Google about Karen Favis Carlos shows that she is the owner and manager of an events management firm called Glamworks. In the firm's website, it describes itself as "a full-service event planning team, specializing in Weddings and Corporate Events conceptualization, planning and coordination services". Carlos is named as the company's Managing Director. You can read Lanzaderas's Facebook post here. Update: Karen Favis Carlos has released an official statement about the issue. Carlos posted the statement on the website of Glamworks Events Management. Read it here.